We arrived back in Kiev last week and returned to find out that we have no hot water for 20 days (annual pipe cleaning)! No problem – this is a regular (minor) issue in Kiev and Katya has years of experience in living without hot water. I’m learning—but it really has not been bad. The hot water should be back on next week. Plus three weeks of camping in National Parks and Forests this summer prepared me too. Even so, I’m looking forward to hot water showers again! We returned to the seminary to see many changes. Some remodeling is being done to improve the bathrooms and so there is dust everywhere. Hopefully it will be finished by the time students come next week. Also, there are a lot fewer professors here this year. A few retired last year and so they will not be returning. Also, some have had to return to the states for medical reasons. Finally, we have quite a few who will be gone this year on furlough, including our academic dean who will be in the states working on his dissertation. In short, there are very few people at the seminary right now so it is pretty quiet here. Also they are not serving lunch at the school yet so we have had the joy of having some professors over to our apartment for lunch. What a blessing it is to be so close to the seminary! Next Tuesday (August 23), we begin interviews and testing for prospective students. This is a very important time at the seminary when we are introducing potential students to the school and its programs (degree tracks) and also interviewing them to make decisions about their entry. We have programs in Bible, Pastoral Leadership, Youth Ministry, Chaplaincy, Christian Education and Missions on the bachelor’s level. We also offer accredited Master’ degree programs in Biblical Counseling, Youth Ministry, and Biblical Studies. So please be praying for us as we interview students next week. I will be teaching a full load again this year – three classes in the fall and three more in the spring. This fall, I will teach Christology, Church History and World History. In the Spring, I will be teaching Theology 4 (Eschatology and Pneumatology), Homiletics 2 and Research & Critical Thinking. Even with all these classes, my main goal this year will be to work on learning Russian. I have 3-4 hours a day scheduled to work on Russian (except for the weeks I teach). Because my teaching schedule does not allow for consistent lessons, I will be trying to learn on my own with Katya’s help. It will be much more difficult this way but it seems to be the only way with my schedule. Be praying for me as I work on learning every day this year. Our summer in the US was wonderful! We were able to visit 4 different churches and see a number of friends and supporters briefly. Most of all, we were able to spend time with family in Arkansas and then we had a great “family reunion” (all my kids and grandkids except for Joel, Alyssa and little Lucas) with Debbie’s’ parents and brother & sister in Sarasota, Florida. We also travelled to the other side of Florida to visit my dad and the MacKenzies from Connecticut. 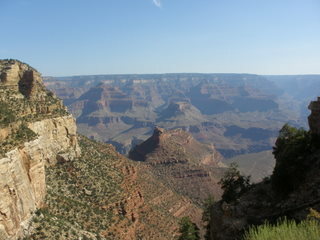 On our own, Katya and I spent 3 weeks in a tent visiting places like the Grand Canyon and the Rocky Mountains. It was wonderful! The splendor of God’s creation was overwhelming. We have more pictures than you can imagine (which you are welcome to see them on Picasa if you send me a request by email). Our time this summer was both relaxing and refreshing after one of the busiest years I can remember! We really did not have the opportunity to work on fund raising so we will be trying to do some this fall. We are thinking more about adding new supporters to our support team rather than trying to raise a certain dollar amount. This way the focus will be on people not money (I don’t like raising funds L). We currently have 19 regular supporters. We would like to have at least 30 people on our support team by December. Pray with us over the coming months that we can effectively communicate with at least 11 more people about the ministry of Teaching Resources and involve them as part of our support team. You have all been an amazing blessing with both prayer and finances through the last 16 years (amazing!) and we cannot express how grateful we are for your prayers and support! Thanks for being part of our team as we minster here in Kiev! We have home is the states for the last two weeks and we have had a wonderful time with friends and family. We have been able to worship with Cornerstone Bible Fellowship and the Bible Church of Cabot as well as getting together with some Home Groups. What a joy it is to be with believing friends! We’ve also had a great time with family … we’ve been camping and swimming and just enjoying being together. Katya and I have also enjoyed some Arkansas treats including going to an Arkansas Traveler’s baseball game, visiting the Ozark Folk Center and Blanchard Springs Caverns. We had shaved ice and ice cream and watermelon too not to mention Mexican food (not much in Kiev!). Tomorrow (July 1st) we head out on a great adventure –three straight weeks of camping. We will head first to the Palo Duro Canyon in Texas and then will stop near Santa Fe and visit a friend in Albuquerque on our way through. Then it will be on to the Grand Canyon for a few days followed by Mesa Verde and then about a week in Rocky Mountain National Park (Colorado). I have never had a vacation this long and I have never camped more than 3 days in a row (last year) so this will be a totally new experience for me. 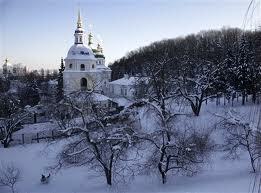 And Katya has never seen these beautiful places in our country. We are both excited even though we will be “roughing it” at National Park campground the whole time. We return the end of July to Arkansas for a week with family and friends and then on to Florida with my children and their spouses and grandkids. From there (Sarasota), we will fly back to Ukraine ready to start the next semester in August. 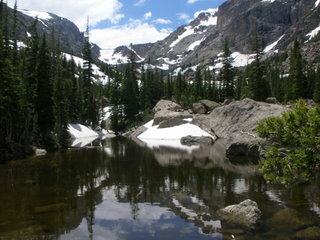 We’ll post a few pictures on Facebook just so you can rejoice with us at the grandeur of God’s wonderful creation! Continue to pray for us and our support levels. We still need some additional people to help with supporting our ministries in Kiev this fall. Also, the General Fund for Teaching Resources has gotten very low this year. Thanks for keeping us in your prayers!! !